Chipper SMD-500 | Welcome to A.P.E. An affordable, totally integrated system for SMT rework and repair. 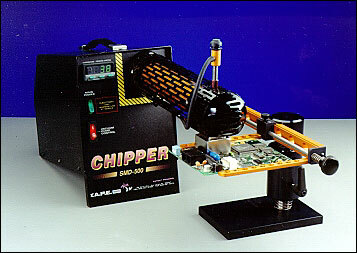 The Chipper SMD-500 is an excellent low cost solution for reworking XBOX 360 systems. Call For More Info! An affordable, totally integrated system for SMT rework and repair, the Chipper SMD-500 is an excellent choice in replacing older “Contact” rework tools with the latest Low Temperature Hot Air technology for reworking SMT components without damage, at a very attractive price. Accurate closed-loop temperature monitoring of a patented High Power heater, reduces rework temperature below 432°F (222°C) and possibly below 400°F (204°C). An automatic vacuum pick-up assembly lifts the part from the board once eutectic temperature has been reached and continues to hold the part during the systems cooling cycle. An appropriate size nozzle is easily installed and the correct temperature is selected. The workpiece is mounted in the board holder and the nozzle placed over the component allowing a gap of 1/8″ (3 mm) above the body of the component. Once the system is switched on, the Controller carries out a “Self Test” and the internal Blower Motor engages to provide a constant stream of high volume, low velocity cool air, which will not disturb or solder ball, within the rework area. A standard 8″ x 8″ (203 x 203 mm) Board Holder is included for most board sizes, adjustable in all axis. A board release mechanism allows each board to snap into place and be quickly released when required. In addition an, on-demand, Z-axis clearance piston avoids profile obstructions, when locating to, or moving from the nozzle.